This year marks the the centenary of the death of one of Ireland's greatest Olympians and Bohola native Martin Sheridan. 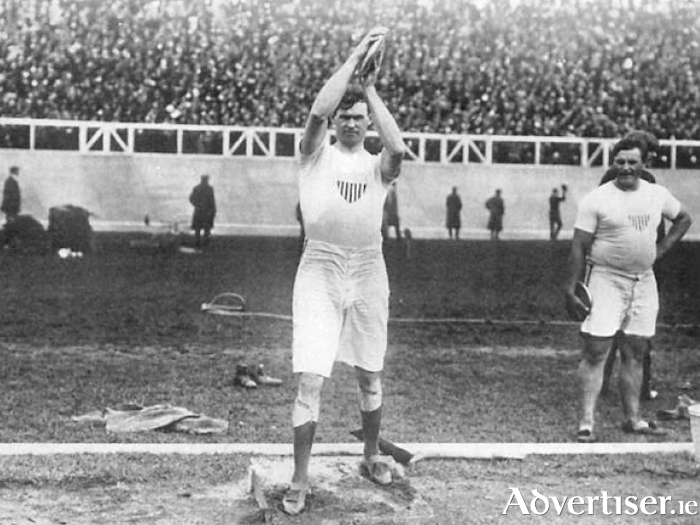 Sheridan who emigrated from Bohola to the USA as a young man, won three Olympic gold and one bronze medals competing for the USA died in in St. Vincent's Hospital in Manhattan, New York, the day before his 37th birthday, a casualty of the 1918 flu pandemic on March 27. To mark this centenary a series of events have been planned to take place on Bank Holiday Monday, April 2 in his home village of Bohola. On the day there will be demonstrations of a number of the field events in which Sheridan excelled in along with a family fun run/walk and a team 8k relay race around Bohola - which is being organised by Swinford AC. Also taking place on the day will be presentation of the Martin Sheridan Bursary and a wreath laying ceremony at a his monument beside the community centre which has been named after him in the heart of the village. The day will get underway at 11am with the family fun run/walk and mixed relay 8k around Bohola, for more details on this event email: [email protected]. From 1.30pm to 2.30pm there will be a field athletics demonstration at the community centre, this will be followed by the wreath laying ceremony at the monument. At 3.15pm the presentation of the 2017/2018 Martin Sheridan Bursary will take place in the community centre and there will also be a display of artifacts from his career on display in the centre on the day. All are welcome along on the day to celebrate the legacy of Martin Sheridan, for more information email: [email protected] or check out the Martin Sheridan Day Bohola Facebook page. Page generated in 0.1496 seconds.